The IndieGoGo campaign has concluded. I’m currently working on putting backer perks together. The standard edition of this deck will be available as soon. My nieces refer to me as Aunt Spooky. And my family? They’re still waiting for my Stevie Nicks as goth phase to pass (it hasn’t.) So I guess it should come as no surprise that I am an autumn girl who celebrates Halloween a little bit each day. A spooky, autumn themed tarot seemed a no brainer. I just wasn’t sure what type of style it was going to eventually evolve into. I knew that I wanted it to be rich and lavish, colorful though dark, and I wanted each card to look like a snapshot of a scene taking place somewhere seldom seen; like a snapshot of the hidden. I decided to use classic paintings as my palate, turning to my most favorite medium; collage. I wanted there to be something somewhat familiar with the scene, while at the same time unique. I divided my themes into three categories: One, the autumn scene. Two, a re-imaging of classic movie monsters. Three, the macabre. As I worked on a card, I also wrote a short story to accompany the character being created. When I started the deck I only made it through the major arcana and realized I was not going to be completing the deck any time soon. There was simply too much going on with our sudden move to Ohio and being there for my husband’s family as his father was moved into hospice. I offered the major arcana for a short time before retiring it. I was approached by a gaming company about publishing the deck after it had a non-pips minor arcana. I began work, when time permitted, to adding cards to the minors. Ultimately I didn’t go with the gaming company. This is due largely to changes they wanted to make and my lack of knowledge when it comes to dealing with a publisher. Skip ahead and here we are now with the second edition of the complete autumn tarot properly named Madam Lydia Wilhelmina’s Tarot of Monsters, the Macabre and Autumn Scenes or Lydia Tarot for short. Madam Lydia, wow, she’s seen a thing or two in her day and I’ve got a story to tell for her. And while the major arcana focused mostly on creating characters or scenes, the minors I based on the Rider Waite Smith so I had more structure to work with. I tried to keep my main themes while still maintaining the mood of the deck. Each suit has a loose theme. The packaging and companion book I tried to keep old timey and witchy. I’ve created a website dedicated to the deck and its dark autumn mythos. You can find that at AutumnTarot.com – Below are samples of the complete and fully edited deck art. 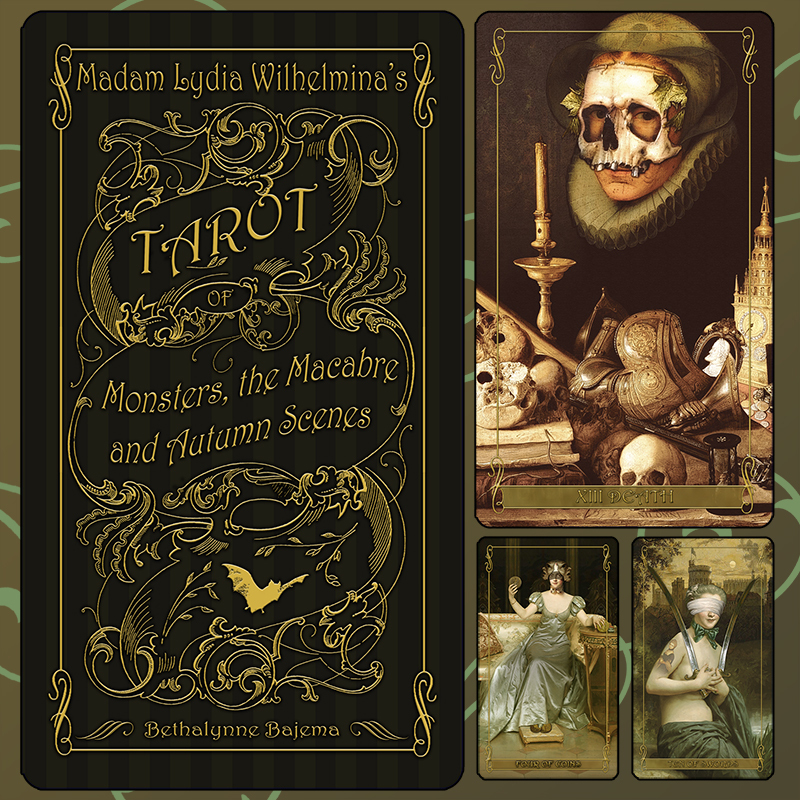 Madam Lydia Wilhelmina’s Tarot of Monsters, the Macabre and Autumn Scenes is copyright Bethalynne Bajema. All rights reserved.